I hope you find this section of interest. & that it will foster a greater interest in Ireland's banknote heritage. 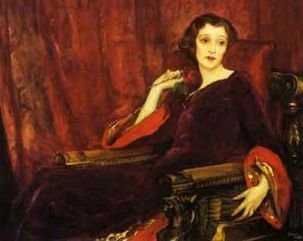 The site is the web presence of Comerford Antiques, Kilkenny based antique dealers,. The initial series of notes, called "Series A", was devised by the Currency Commission, these notes were printed by Waterlow and Sons, Limited, London whichwas acquired by De La Rue. The commission created an advisory committee which determined the theme and design of the notes. Notes were in the denominations of 10/-, £1, £5, £10,£20, £50, and £100. which aredepicted as heads taken from the Custom House, Dublin. Whilst there was some uncertainty as to which rivers were depicted it is agreed that rivers in both the Irish Free State and Northern Ireland were chosen. Each note also contains a watermark of the Head of Erin. 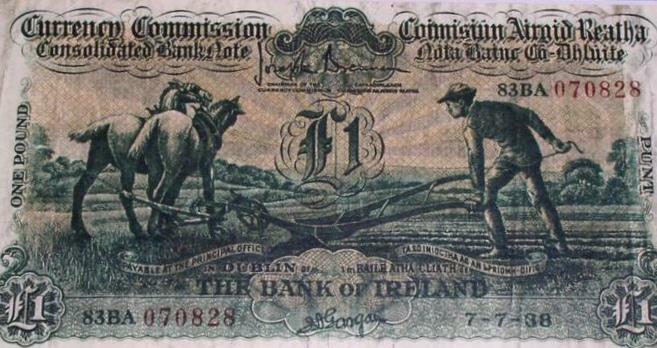 Irish lady lavery & 'ploughman' series banknotes have always enjoyed a very strong following amongst collectors. As with the coinage of Ireland, the advent of online outlets especially ebay, irish banknotes are now widely available to collectors internationally. these banknotes (particularly the better examples) represent a sound investment as supply inevitably declines. 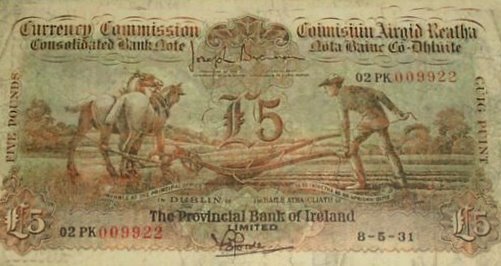 The hugely collectable, almost enigmatic 'ploughman' series of irish banknotes represents one of the world's most sought after banknote types. 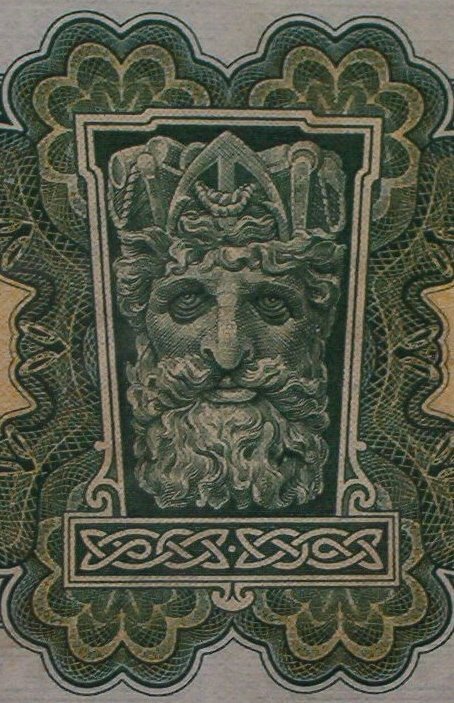 These notes were issued as a transitional measure for eight banks ("Shareholding Banks" of the Currency Commission); Bank of Ireland, Hibernian Bank Limited, Munster & Leinster Bank Limited, National Bank Limited, Northern Bank Limited, Provincial Bank of Ireland Limited, Royal Bank of Ireland Limited and Ulster Bank Limited. These notes were issued, first, between May 6 and June 10 of 1929 under the arrangement that the banks withdraw previous notes they issued and refrained from issue of further notes. The consolidated notes were only issued by the Currency Commission and the last notes were printed in 1941, the notes were officially withdrawn on December 31, 1953. Each note contained the common design of a man ploughing in a field with two horses on the front and they are often referred to as the "Ploughman Notes" because of this, the main differences were the name of the bank and its authorising signature. The notes denominations, and the back designs were; £1 (Custom House, Dublin), £5 (St. Patrick's Bridge, Cork), £10 (Currency Commission Building, Foster Place, Dublin), £20 (Rock of Cashel, County Tipperary), £50 (Croagh Patrick, County Mayo) and £100 (Killiney Bay, County Dublin). 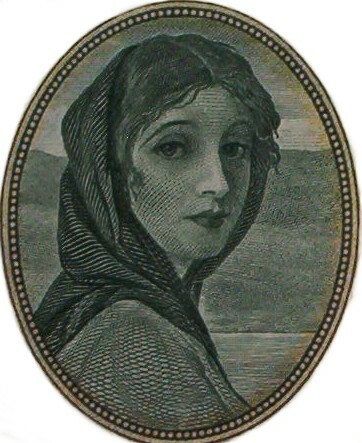 figure from Irish history or literature. in the Ulster Cycle of Irish mythology. Isaac Bickerstaff, M.B. Drapier — or anonymously. and was co-founder of the Abbey Theatre. Carolan (born 1670, near Nobber, County Meath, Ireland, died March 25th, 1738, Alderford, County Roscommon), one of the last Irish harpist- composers and the only one whose songs survive in in significant number (about 220 of provable provenance are extant with an uncounted number apocryphally attributed collections. reserved for members of the established Church of Ireland. he is a key figure in the development of the modernist novel. He is best known for his landmark novel Ulysses (1922). (1914) and the novels A Portrait of the Artist as a Young Man (1916) and Finnegans Wake (1939). 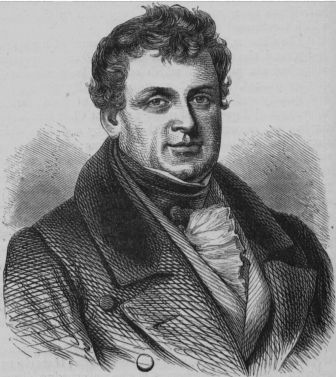 (1775 – 1847) known as The Liberator or The Emancipator, Daniel O'Connell was Ireland's predominant political leader in the first half of the nineteenth century who championed the cause of the Catholic population. He campaigned successfully for Catholic Emancipation, achieved in 1829. Douglas Hyde (1860 – 1949) was an Anglo-Irish scholar of the Irish language who served as the first President of Ireland from 1938 to 1945. He founded the Gaelic League, one of the most influential cultural organisations in Ireland. 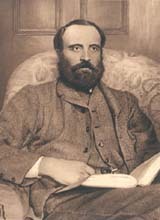 Charles Stewart Parnell (1846 – 1891) Irish political leader and one of the most important figures in 19th century Ireland and the United Kingdom; William Ewart Gladstone described him as the most remarkable person he had ever met. A future Liberal Prime Minister, Herbert Henry Asquith, described him as one of the three or four greatest men of the nineteenth century, while Lord Haldane described him as the strongest man the British House of Commons had seen in 150 years. The Higest denomination in the series, the £100 Banknote.